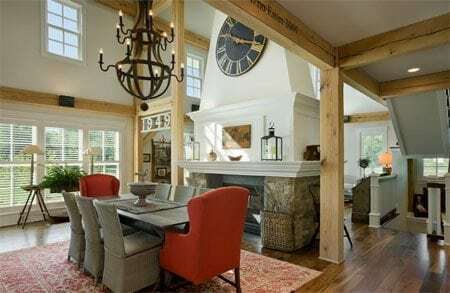 The tradition of timber frame homes goes beyond their designs tailored around beautiful interior spaces highlighting natural elements. When you design a wood home, the incorporation of light, both artificial and natural, is an important facet to your project’s finished look and feel. With the help of your designer, you can illuminate your home’s interior in a warm, natural glow, no matter the design. Most often seen in the communal spaces of the home, a wall of windows allows a practically unobstructed view of your land while providing optimum levels of natural light to filter through the home. This design can utilize a series of small windows to complete a wall or can be comprised of a few large windows depending on your desired final look. Clerestory windows are windows placed above eye level in a space to provide natural light without compromising privacy. These windows serve their purpose without distracting from the room functionality. They are also capable of capturing light earlier in the mornings and later near dusk, due to their elevated location. A common feature in timber frame homes built in mild regions, sun rooms have the ability to not only provide natural light and pristine views, but they offer a space to enjoy the surrounding land at any season. Being enclosed spaces, these rooms act as outdoor living spaces with the comfort of the home’s interior. Dormers are a great feature to add to the home’s dimensional design as they allow natural light to flow into the home. Protruding from roof planes around the exterior, dormers can vary in size, shape and location to provide aesthetic appeal and varying levels of light intake. Work with your architect to discover what window styles work with your design and how to best harness natural light within the home.